All submissions first go through an internal peer review process by a specialized editor assigned by the editorial board. Each submission is reviewed by the assigned editor who makes an initial decision to send the manuscript out for peer review or to reject without external review. The editorial board makes the final decision. Articles can be rejected at this stage for a variety of reasons such as similarity with a recently published article, the topic is outside of the scope of the Journal, little new information is provided, important flaws in the scientific validity, or an unprofessional presentation. If the editor believes the article may be of interest to our readers, it is then sent out for external peer review. We employ a 'double-blind' reviewing system (where the reviewer remains anonymous to author, and the reviewer is unaware of the identity of the author). All submissions are assessed by a number of, not less than two, specialized reviewers. In the external peer-review process, the editorial board identifies potential reviewers. Potential reviewers are contacted about their availability and interest in reviewing. Inquiries to reviewers are sent via RR automated E-mail messages, which include the manuscript abstract and the assignment deadline. When prospective reviewers agree to serve, they are permitted access to the manuscript and reviewing instructions. 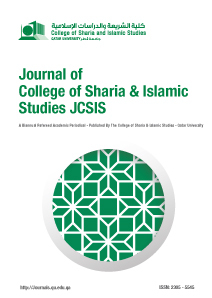 Reviewers send their critique back to the Journal of College of Sharia and Islamic Studies (JCSIS) using the RR system. 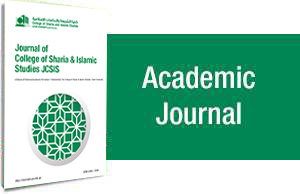 Once a sufficient number of two thoughtful reviews are obtained, the editorial board makes a judgment that takes into consideration the critiques and recommendations from the peer reviewers. We also take into account the number of manuscripts in the queue to be published as well as our impression that the paper can be suitably revised. Moreover, the editorial board reserves the right to decide what articles will be published first. Frequent reasons for rejection after peer review are based on an assessment that the paper doesn't provide enough new information, or if the message is too complex or too narrow. Further more, when the manuscript is accepted without revision, the publication procedures are completed and the author is informed of the acceptance of his or her manuscript in writing. If minor essential revisions or major compulsory revision is requested, the manuscript shall be returned to the author with the comments of the reviewers for amendment. When the manuscript is rejected, the author is informed of that.